What’s the secret to a successful trade show exhibit? Trade show veterans would say, there’s not one single thing that guarantees success. Of course, you need to have a display that stands out. And sure you need to know how to work the crowd. But before you even get to these details, you have to have a solid trade show marketing plan. You wouldn’t launch a product or a service without a marketing strategy, right? So why shouldn’t you do it for a trade show or any event you plan on attending? Here, we’ll talk about how to build an effective trade show marketing strategy and how to execute it to get the best ROI. To have an effective marketing plan, you need to build it around your target audience. That means you can’t attend just any trade show. You have to find events where you can market to your ideal customers or those that are specific to your industry. The good news is those events aren’t hard to find. You can search for them online. Or you can check which shows your competitors are attending. The earlier you can have a list of events to attend, the earlier you can register for them. That means you’ll have more time to prepare for the shows, plus you wouldn’t have to worry about not securing a good booth space. Your trade show strategy is useless if you don’t set clear goals. So start by asking yourself and your team, what you’re hoping to accomplish by doing this show? Are you hoping to increase brand awareness? Or do you have sales-related goals in mind? Maybe, you want to accomplish several things, and that’s okay, too. The important thing is you write down those goals, work to achieve them, and avoid straying from them. And it’s not only you who should know those goals. Everyone should be onboard. When you have a draft of your trade show goals, check to see if they are SMART ones. SMART stands for Specific, Measurable, Attainable, Results-oriented, and Time-bound. This will include the staff you pick, your display, equipment, and marketing materials. Tip: If you’re trying to keep costs manageable, invest in reusable materials. Or you can look into used booths as well as rentals. Your pre-tradeshow checklist should also include your buzz-building strategy. You should be marketing way before the event. 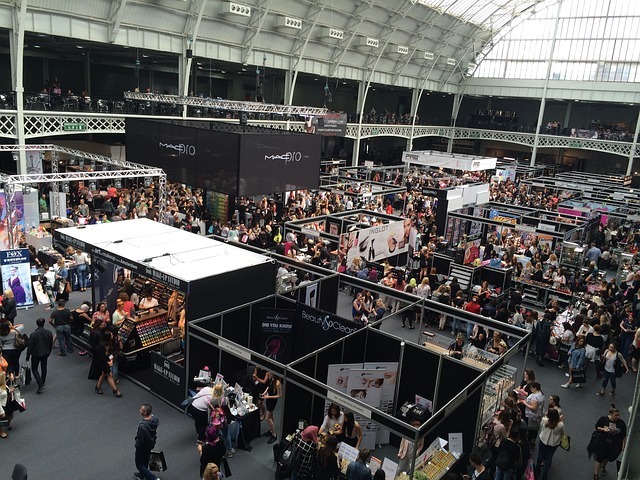 Make sure your customers know which events you’ll be exhibiting in. You can do this by sending them e-mails or through social media. Blogging about these events is also a great way to generate buzz. If you’re hoping to reach out to new customers before the trade show, you can try online ads or ask your existing customers to help spread the word. Having a kickass booth is a must for trade show success. But be sure you don’t forget to network, especially if you’re attending a show that’s specific to your niche. If there are opportunities to speak, grab them. You can establish yourself as an authority in the subject and it will build trust among customers and industry peers (aka potential business partners). Of course, if you’re going to be a speaker at a trade show, don’t make your speech all about you and your company. Offer real value to the attendees or you’ll never be invited to speak at future events. Another way to stand out is to be one of the sponsors of the show. But keep in mind that you should only do this if you have funds to spare. Becoming a sponsor isn’t exactly cheap. So it may not be the best marketing option for you if you’re a small business or a startup. Now that you have the basics for a good trade show marketing plan, the next step is to execute it. During the show, you need to really work it. Don’t let your booth design do all the work for you. Be inviting, but don’t be too pushy. You only have seconds to impress the people who drop or pass by your booth. If you have giveaways, don’t just give them away. Everyone loves swag. But come up with ideas to make it exciting for you and for them. Games or product demos are perfect for this. And of course, don’t forget to get leads while you’re making a splash. Find a way to get booth visitors to give you their email address, as well as other contact details. The trade show’s over. That means you’re done, right? Nope. You may be super tired but after the show, you still have a lot of work to do. For one thing, you can’t let the leads you got go cold. Even if these leads didn’t buy from your booth or engaged with you for a long time, the mere fact that they left their contact details with you means they’re interested. Take this opportunity to send them an email. It could be as simple as a thank you note with an invite to further connect with you via a phone call. Or you can connect with them on LinkedIn. But remember not to spam them. Yes, you’re excited to touch base with your new leads. But that doesn’t mean they want to hear from you every day. You’ve got a solid plan and you have an idea on how to execute your trade show marketing strategy. But if it’s your first time, you may be feeling overwhelmed by the number of things you have to prepare for the show. Whether it’s your first time or not, we can help. We have tons of tips and advice for trade show exhibitors. We also offer a full suite of trade show exhibit and event services.